Dare we say it? Even though we’re mid-way through August, it is almost time to be thinking about those dreaded three words… Back. To. School! However, no matter how hard it is to go back to school or university after a very long and probably very fun-filled break, there’s always a bright side to the new-term blues. Heading back to school is always the perfect excuse to get kitted out with some fresh new stationery, and to start setting and reaching new goals. That’s why we’re going to be showing you how to create some fun back to school craft projects, including a way to add a touch of personality to a plain notebook and how to organise your notes in a cool organiser project. 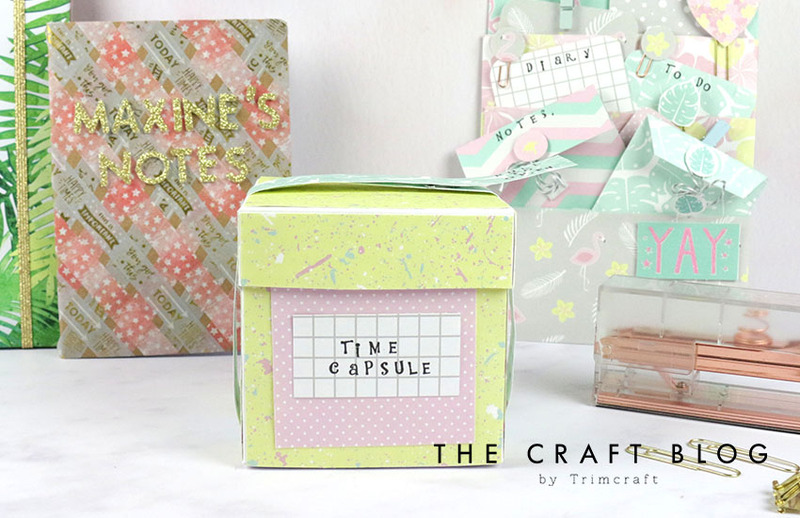 This DIY time capsule craft is a great way to start and end the academic year. For any age, the thought of going back to school and starting a fresh year can be daunting, with so many new topics to learn and new friends to meet. Sometimes it helps to record down thoughts, goals, and feelings going into a big year, before reflecting on how far you’ve come by the end of it. Our DIY Back to School time capsule is a great way to preserve memories from the first day of school, giving you space to jot down goals and feelings, as well as add photographs and more! Once you’ve added these to your time capsule, simply pop on the lid and seal it shut. Open at the end of your school year and see if you have achieved the goals that you set! 1. Cut two pieces of the white cardstock to 30cm x 22cm, score at 10cm and 20cm, and then turn and score at 10cm on both pieces. Cut away the piece below the 2cm score line as show below. 2. Fold along the score lines, adhere together using the 2cm flaps to join them. Fold in the bottom and adhere together. 3. Cut another piece of cardstock to measure 16cm x 16cm. Score at 3cm on all sides. Make a cut at each corner to the 3cm score. Fold in at the sides and adhere to create the lid. 4. Cut pieces of backing paper to fit the sides of the box and lid, then add an 8cm square of paper to the centre of each side of the box. Stamp the words “Open Date” onto a piece of paper and adhere to one side, and “Time Capsule” to another piece, adhering it to the opposite side of the box. 5. Cut a selection of 9cm x 8cm pieces of cardstock from the Let’s Flamingle paper pad. Round the edges off and stamp words to the top corresponding to what you’d like to track across the academic year, such as: “Feelings” and “Goals”. 6. Fill in the cards and place them inside your time capsule before placing the lid on. 7. Cut two strips of Let’s Flamingle paper 3cm wide and adhere the strips together to make one long strip. Stamp the words “Pull to Open” onto one end and seal around your time capsule. Open at the end of your school year and see if you have achieved the goals that you set! Why not jazz up your plain notebooks by decorating them with washi tape designs? Just a few simple lines of washi can make a huge difference and you’ll definitely know which notebook is yours! Keep all of your notes and lists in one place and create your own DIY desktop organiser! Include sheets to jot down your to do lists, notes, ideas and more. Create customised, matching paperclips by fussy cutting shapes from the fun Let’s Flamingle paper pad. Will you be trying any of our back to school crafts? We’d LOVE to see so don’t forget to share your projects in the Inspiration area and to #Trimcraft when uploading to social media!